There’s beauty in the act of expressing deep appreciation for an element of culture. Sadly, a writer will take this idea way past Why I Love This to I Will Now State Spurious Facts. Recently, Neil Peart, the drummer/lyricist (it is important that you list him as such) of Rush was interviewed by Rolling Stone, and the exchange featured the quote above from writer Andy Greene. As one of the millions of late-period Gen-Xers to spend most of my teen years obsessed with this Canadian trio, I must respond to such a casually tossed-off statement of hagiography – and the maxim that aiming to have your creation heard/seen by others is always a bad thing. Now if by commercial, they mean “eschewing songcraft for cynical hit-factory cash-grabs”, sure (although the melodic power-pop of “Bacchus Plateau” from Caress of Steel could easily be re-tooled to target mass appeal by the Partridge Family or other big-budget teen-pop of the time), Greene is correct. Or it could mean that their music has not appeared in any actual commercials, outside of those moments in baseball telecasts where passages from instrumental tracks like “Where’s My Thing” or “YYZ” will serve as the background as the announcers switch into promo-mode for “Tonight…Conan gets cra-AYzy with The Vampire Diaries’ Nina Dobrev…” or “Will Dwight ever find his stapler? Find out on The Office, tonight at 9, 8 central…!” However, three arguments can be made that Rush has, in fact written a commercial song, or, in all seriousness, songs. 1. Analog Kids and Digital Men. Rush has never been a static band, as their willingness to embrace emerging styles and genres within their music can attest. Cheeseball synthesizers in “Xanadu” and “Subdivisions”; the post-punk meets disco of “Red Sector A” (and most of Grace Under Pressure – an album that has to be a fave of DFA and James Murphy); reggae in “Vital Signs” and “The Spirit of Radio”; post-Trevor Horn keyboard textures of “The Big Money” and “Force Ten”; and the Grunge/Nu-Metal of “Cut to the Chase” and Lifeson’s Victor album – Rush was always engaging with the music around them, allowing it to influence and advance their songwriting (often angering old fans as much as impressing the new ones). Save for the occasional dalliance in classic folk idioms, Rush’s general ethos emphasizes a look to the future – or at least the present – rather than the past. Such respect of modernity is, by nature, a commercial act, whether or not it is intentionally so. In 1985, Rush released Power Windows, their most quote-unquote-pop record of their career (spelling out the words does add an air of significance). 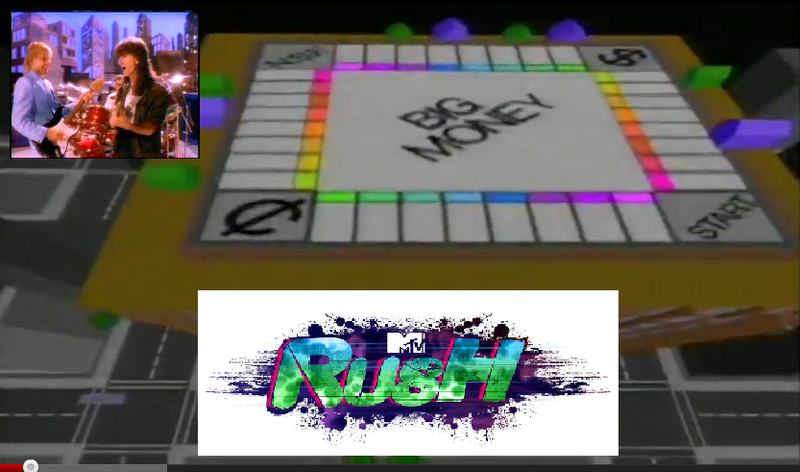 After Grace Under Pressure’s “Distant Early Warning” got a few spins on the emerging network of MTV, Rush’s label commissioned a video (which is industry slang for – you guessed it – commercial) for the first single from their new record, “The Big Money”. Following the post-TRON animations and soundstage-based “live” performance format that was de rigueur (see Devo, Dire Straits, etc), “The Big Money” spent a few weeks within the network’s Top 20, providing a dose of awesome amongst a schizophrenic collection of artists like a-ha, Lionel Richie, Starship, Whitney Houston and Mr. Mister. Not to mention the fact that the original album track – most notably the introduction – was excised by several seconds to meet the 5-minute guideline. Did their grand designs for everyday glory result in their earning of a larger bowl of big money hand over fist, or were these Middletown dreams a failed mission with no one at the bridge, where working men expected something for nothing? Should Rush have rolled the bones for the limelight? Or left that thing alone? You bet your life! 3. Carve Away the Stone Extra Minutes. In addition, the act of writing a song within the three-to-five minute structure of the rock/pop/metal/rap/chillwaves/flubstep//:wwwhatevs idiom is inherently a commercial act. If we were to adhere to the critically-forced dichotomy of commercial and anti-commercial, with no middle ground, then Rush has written not one, not two, not ten, but over 100 commercial songs. As much as I love Rush’s lengthy pieces, like “La Villa Strangiato”, “Close to the Edge”, “In the Court of the Crimson King”, “Echoes”, or “Tarkus”, I’m part of a society that’s been conditioned to view the idea of Song as a two-to-five minute sequence of shorter components called “intro”, “verse”, “pre-chorus”, “chorus”, “bridge”, “solo”, “outro” arranged in some fashion; just as a music fan was conditioned on sonata form during the time of Wolfgang Mozart, or odd substitutions of English where the Italiano should be in the Eugenics-era crank-fest of Percy Grainger, the “Oh, you expect me to write your parts?” time of John Cage, or the “In measure 12, rest for five counts and drink a glass of wine, then smash that glass on a marimba” of George Crumb. Would we have wanted it any other way? It’s an awesome article designed for all the internet visitors; they will obtain benefit from it I am sure.